We have always wanted to be that guy that makes the next great app. The perfect app that takes you and your small company into the strastosphere. Look at Angry Birds, Instagram, and Words with Friends. The best thing about webOS if you don't know already, we have the most talented and creative developers. Developers like Inglorious Apps with Notes HD, Arthur Thornton with Sparrow, and James Harris with Flash Cards who have really inspired the next generation of app designers. Why? Because webOS remains one of the best platforms to develop on. 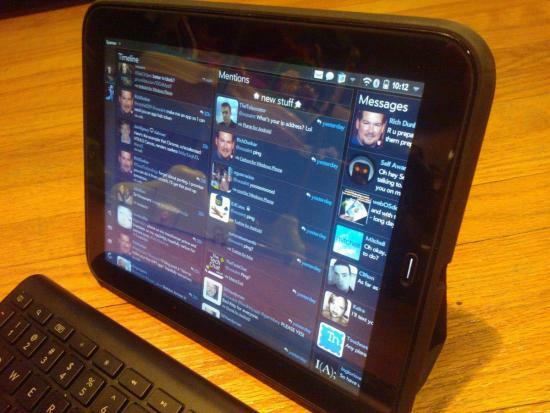 When webOS goes fully open source in the fall its only going to get even better and easier. So... you want to get in on the game, but you don’t have the skills. No problem, because with the Science Apps' new app webOS App Builder you can start building your own custom apps in no time flat. What do you get when you combine Minesweeper, logic puzzles and pictures together? 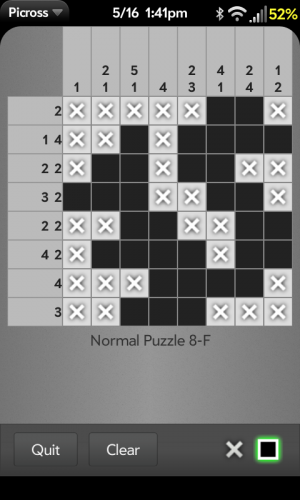 The answer is Picross, a fun and addictive game by PenduinBits that challenges you to solve picture puzzles (or picture crosswords, as the app name indicates) on an 8x8 grid solely using number clues that indicate how many blocks you need to fill in on a given row or column of the grid. For $0.99, you get 384 puzzles split between Easy, Medium and Hard levels, and even a Builder feature that lets you create up to 64 more of your own custom puzzles. And with a minimum webOS requirement of only webOS 1.4.5, one purchase will work on all your webOS devices from the original Pre or Pixi to the newer Pre3 or TouchPad. Despite deep Synergy integration between webOS and Facebook in the Contacts, Calendar, Photos and Videos apps, we have yet to see Facebook Chat make its way to the Messaging app without the benefit of any homebrew assistance. 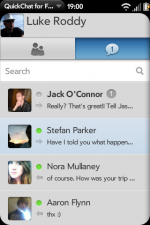 Although there are a few instant messaging apps in the App Catalog that includes Facebook Chat, none have the ease and simplicity of QuickChat for Facebook, by pcworldSoftware, nor are any of them built using Enyo to support both the small screens of webOS phones and the larger real estate of the TouchPad. For $2.99 (on sale, normally $3.99), QuickChat for Facebook is available for any webOS device running webOS 2.1 or higher and brings you a dedicated Facebook Chat app that does its best to mimic the stock Messaging app of the TouchPad. Upon launching the app the first thing you must do is log in to Facebook. 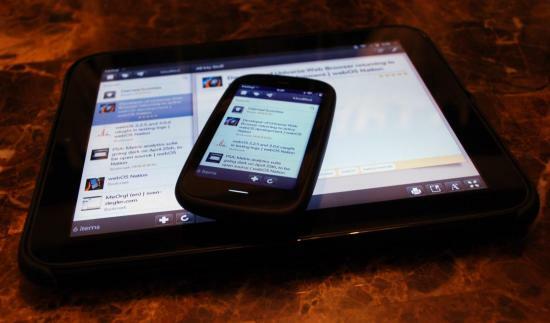 On the TouchPad, you are then brought to a very familiar looking scene with a panel on the left that allows you to toggle between your online friends or your conversation history, and a larger pane on the right that houses your conversation. On phones, you just view that left-pane by default, and the conversation pane will slide in Enyo-style once you tap on a buddy or a conversation. As long as the app is open (unfortunately, this is a webOS limitation), it will receive any chats or messages received in Facebook in real-time and even has push notifications to alert you if the app is not the active one. If you know how to use the Messaging App for IM or SMS messages, you will be right at home in this app. It works really well and adds a much-needed piece of Synergy to webOS, although there are a few limitation with how Facebook Chat works with the app, mainly due to the available APIs from Facebook. Missing conversation history -- While your Facebook chat history will be loaded into the app once you log in, some conversations may be missing. The developer and I troubleshooted this in detail and determined it was actually a Facebook issue and nothing the app had any control over. As a result, this may also cause some conversation history to be lost when you relaunch the app in the future. However, that conversation will still be available on the Facebook website or the webOS Facebook app. Group chats or messages are not available -- Due to Facebook API limitations, you are only able to send/receive messages/chats from individuals, and the conversation history of multi-person chats or messages will not be shown in the app. 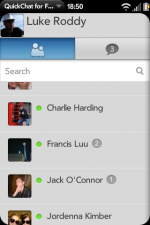 If you need to send a group-message, you will need to launch the webOS Facebook app to access this. 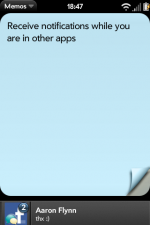 Other known issues -- The Developer has a "Known issues" page in the help section of the app that also documents some other issues, such as an occasional disconnect from the Facebook servers or profile pictures missing or not being updated. Once again, these are either Facebook or webOS restrictions, but the developer has work arounds for these built in minimize the impact on your user experience. With all of these issues or limitations, you may be wondering why you shouldn't just use the messaging section of the Facebook apps for your phone or TouchPad or the web browser itself. The biggest reason for me is the real-time messaging and push notifications built into the app. If you rarely use the chat or messaging features of Facebook, this is proably not for you]. But if you send a lot of messages or even just occasionally Facebook Chat, then you should consider this app. And best of all, a single purchase will allow you to download the app on both your phone and TouchPad (as long as they are on the same webOS profile). 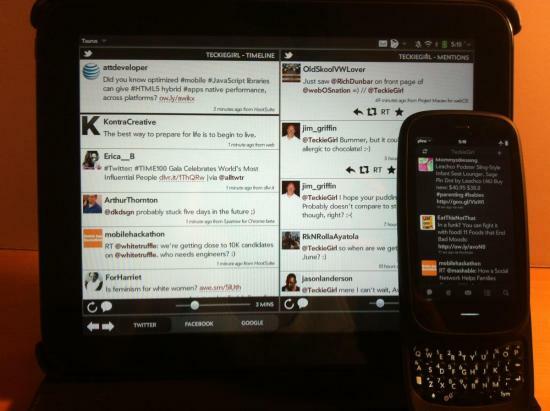 Way back in 2009, the Palm Pre and webOS were still new to the world. Also new to the world was Evernote, who released an app built with the also new Mojo framework for webOS. 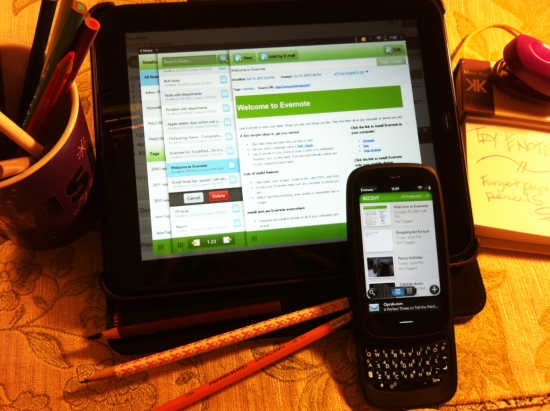 It was a decent app, but it struggled to keep up with changes made to webOS and the Evernote system. So long as you had a webOS smartphone, though, it generally worked. At least, it did until last month, when Evernote made modifications to their API that killed the app for weeks until enough webOS users complained and Evernote brought it back. The change to the API also affected a fledgling app for webOS that brought Evernote to the TouchPad in proper Enyo fashion: E Notes. Put together by PetzApps, E Notes does require an Evernote account, but that’s not exactly a difficult thing to register and you can do it through the app if you don't already have one. Evernote will even give you a very unique and very long email address that allows you upload notes anytime, anywhere. We would advise you to save your new email in your contacts in your system. E Notes takes full advantage of webOS' Enyo app framework, utilizing a beautiful sliding pane system that aids in multitasking, making it a breeze to jump from one task to another. E Notes even has a notifications to keep you updated when a note, notebook, or tag on your account has been altered or has been added. We can all agree that the hallmark, the crown feature, of the webOS platform is its unmatched multitasking user interface. There's simply no equal to its prowess. webOS also has been one of the leading platforms for Twitter clients, though that perhaps hasn't been as evident lately. For years webOS has had some of the best Twitter clients in the mobile space, and while many have fallen behind, there are always a few more coming up and ready to take their place, and thankfully they keep spoiling us with quality user interfaces and beautiful design. The latest entrant takes after the conventions of incredible!, bringing a new unified social networking experience to the TouchPad: Taurus. This new social app by OMA Studios has hit the webOS App Catalog, bringing a single-app multi-pane social networking experience unlike that offered by other apps. While incredible! seeks to integrate your networks into one stream like webOS tries to integrate your contacts and calendars, Taurus brings them into one app, but keeps them segmented so that even more dissimlar social network and systems can join the mix. A full Taurus cocktail can contain Google Reader feeds, LinkedIn, Twitter, and Facebook streams, YouTube subscriptions, and your ToodleDo tasks. It's one heck of a cocktail. Pandora has been available for webOS for as long as webOS has been available, but the app never made it to the TouchPad. Sure, there is the HTML5 webapp for Pandora, but we'd rather not have to work it through the browser. We need something less finicky, and that's where the Jake Morrison and Taylor Kimmett's new app Apollo Radio comes in. Pandora, for the uninitiated, is sort of like your own personal DJ. Based on the Music Genome Project, Pandora's algorithms allow users to build their own personal radio station around their musical preferences. Tell Pandora what music you like, and Pandora digs up other music that it thinks you'll enjoy. If you aren't enjoying what Pandora's served up, you can give the song a thumbs down and Pandora will remove it from your playlist and adjust its predictions for your musical taste. After a while, Pandora can build up a fairly good idea of what you will and won't like. The service is provided free of charge, only asking that you listen to some ads along the way to help pay for the music and servers. Pandora has historically made their own app, releasing versions for all major smartphone platforms. As Benjamin Franklin said in 1789, in this world nothing can be said to be certain, except death and taxes. While your webOS device can't help a whole lot with the former (although it can help you stave off your inevitable end with improved health and fitness), for those of you in the United States who may still be burning the midnight oil working on your 2011 taxes and the crazy tax code nerds out there might find TouchTax to be a handy reference to keep on your TouchPad. Its interface and functionality limitations, though, may be a bit too taxing for many users, and the $2.99 app does provide e-filing or tax return features - TouchTax is all about the information. The overall interface for TouchTax is a standard Enyo layout, with sliding panes. The leftmost pane offers Quick Links to the Internal Revenue Code (the law) and Regulations overseen by the Internal Revenue Service, a comparison table of section numbers from the original 1939 Code and its 1986 major revision, and IRS Forms, along with Application Support. 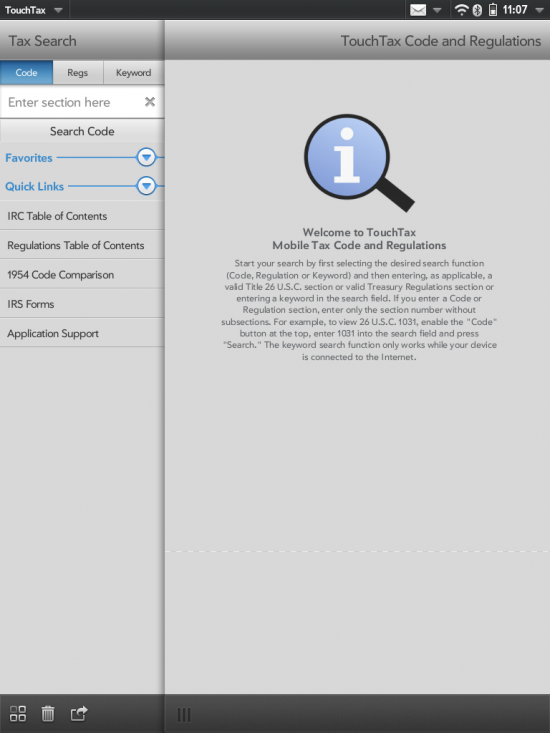 Links really is the operative word: the application merely launches a separate browser window directly to the relevant portion of the IRS Web site for the Code, Regulations and Forms options.